Newspapers have long played a major role in the life of New York City. The first papers read in the colonial coffee houses of Wall Street grew to eleven dailies in 1835, when the city had only 270,000 inhabitants. Circulation expanded enormously in the following decades, with the New York Herald boasting a daily circulation of 77,000 in 1860. 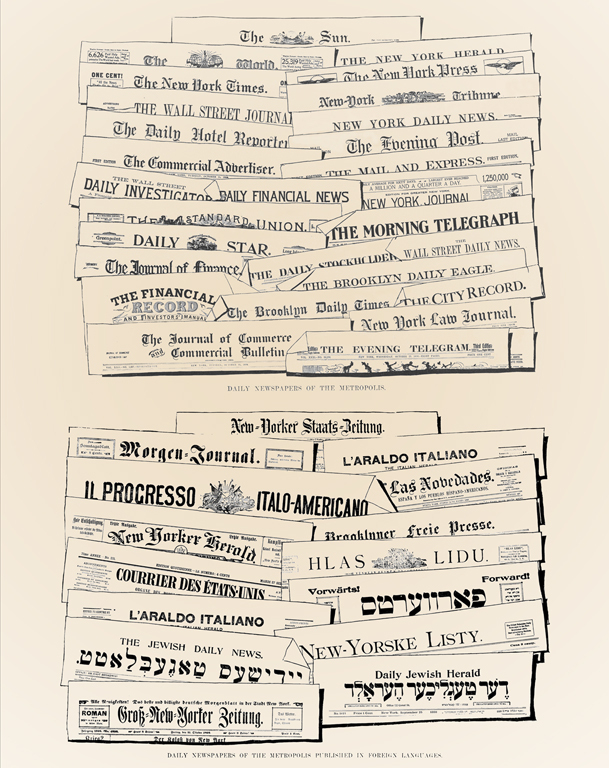 By the last years of the century, as the illustrations of the collected newspaper nameplates at the left show, New Yorkers could choose among forty-three metropolitan dailies--twenty-eight in English and fifteen in foreign languages. The three largest papers had huge circulations--more than 500,000 for the Herald, 390,000 for the World, and 320,000 for the Journal. The Sunday supplement of the World trumpeted its status of the highest circulation on the planet in its own advertisements and Almanac, claiming sales of 600,000. Papers competed on price, and the "penny press," first established in the 1830s, became an arena of intense competition again in the "yellow journalism" wars of the late 1890s, in particular between the Joseph Pulitzer's World and William Randolph Hearst's Journal. The leading dailies courted readership by focusing their coverage on crime, sports, celebrities, and scandals, as well as feature stories and scoops. Even Adolph Ochs's New York Times decreased its price from 3 cents to 1 cent, with the result that circulation tripled from 25,000 to 75,000, establishing the Times as a major daily. In the 1920s, tabloids grew in popularity, and in 1925, six years after its first issue, The Daily News had a circulation of one million readers. The changing nature of the newspaper business and the rise of radio dramatically reduced the number of major dailies over the course of the first half of the twentieth century: by 1964, ten of thirteen papers publishing in 1904 had merged or folded.